UK unemployment is falling and inflation has rebounded towards the Bank of England’s 2 percent target. Any policymakers who are opposed to an early rate rise can point to the persistent and puzzling weakness of wage growth. But the cards are increasingly stacked against them. The UK unemployment rate fell to 6.5 percent in the three months to May, the lowest since 2008, the Office for National Statistics said on July 16. The proportion of people aged 16-64 in work rose to 73.1 percent for the three months to May. This employment rate last reached this level in the three months to February 2005 and has never been higher since records began in 1971. Britain’s inflation rate rose to 1.9 percent in June from the four-and-a-half-year low of 1.5 percent in May, data from the Office for National Statistics showed on July 15. Economists polled by Reuters had expected a reading of 1.6 percent. 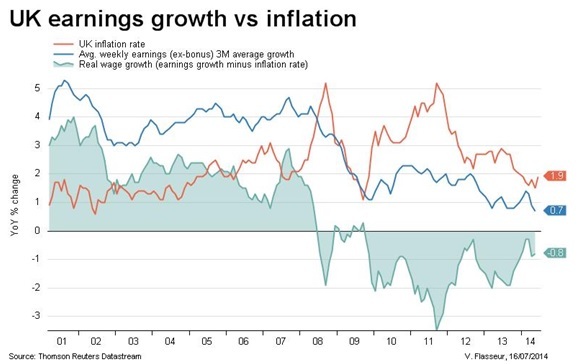 Pay including bonuses for the three months to May was 0.3 percent higher than a year earlier, the lowest growth rate since 2009. Pay excluding bonuses rose 0.7 percent over the same period, the weakest annual growth rate since records began in 2001.